Interlocking brick machine is used to produce interlocking bricks that make footpaths or paths in lawns, parks, gardens, etc. It is an ideal choice to invest a interlocking brick making machine for many medium-scale and small bricks making manufacturers. Because there are many advantages for buying a good quality interlocking brick machine, for instance high efficient working rate, low cost of investment, high reward, etc. Interlocking brick machine for sale has greater flexibility since it could change molds at customers options so as to make various shapes of interlocking bricks. 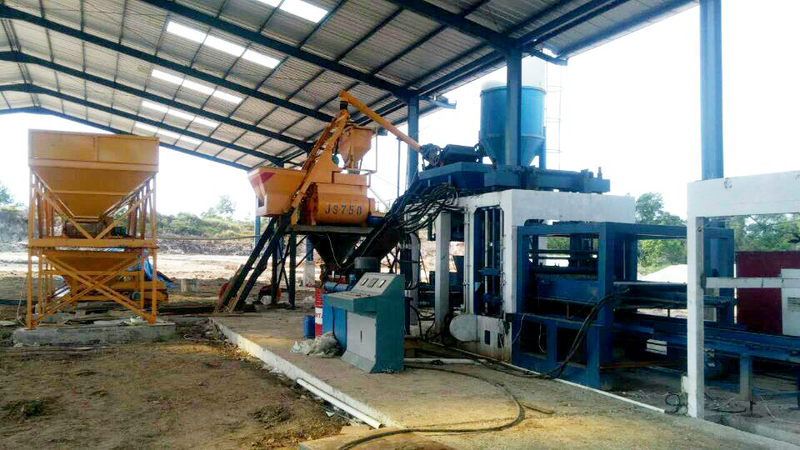 Interlock brick machines commonly use stone powder, fly ash, slag, gravel, sand, water and so on as raw material. The interlocking bricks can be divided into: sidewalk s-type interlocking bricks, high-speed water conservancy projects interlock bricks for purpose. 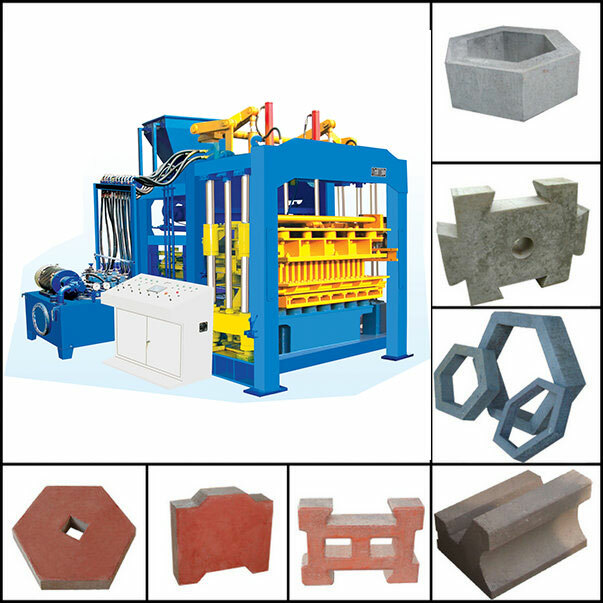 We aimix group is a noted interlocking brick machine manufacturer. We founded in 1982, has a long history for over 30 years. Moreover with constant development and absorbing advanced technology from abroad, till now our good-quality of interlocking brick machines have been appreciated by customers overseas. 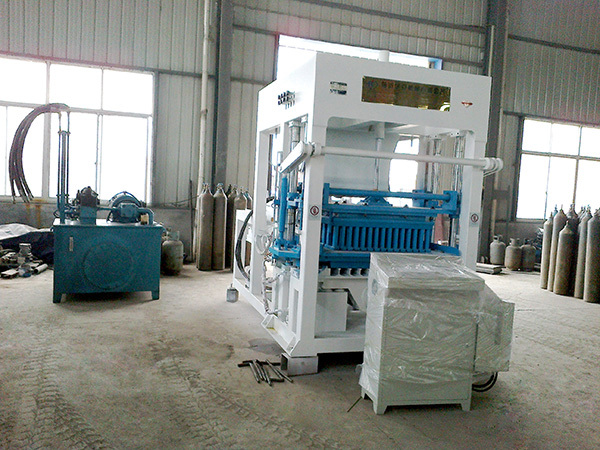 We have exported our interlocking brick making machine to more than 30 countries. They have received high praise on their stable performance, easy operation and cost-effective merits. We can supply the most favorable interlocking bricks machine price than many other peers. There are a variety of interlocking brick making machines we can supply, especially the QT series, which are hot sale products in interlocking bricks market. QT series are kinds of automatic interlocking brick making machine that could achieve a mess of production of interlocking bricks automatically. It has the features of high efficiency, excellent design, compact structure, simple operation, easy maintenance. 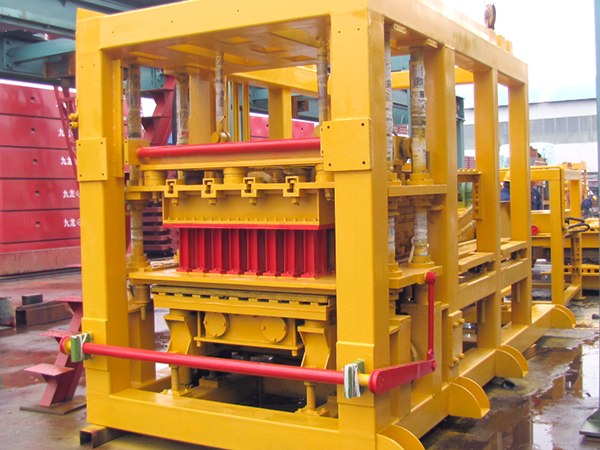 There are many core strengths of interlocking block machine sale from Aimix Group. 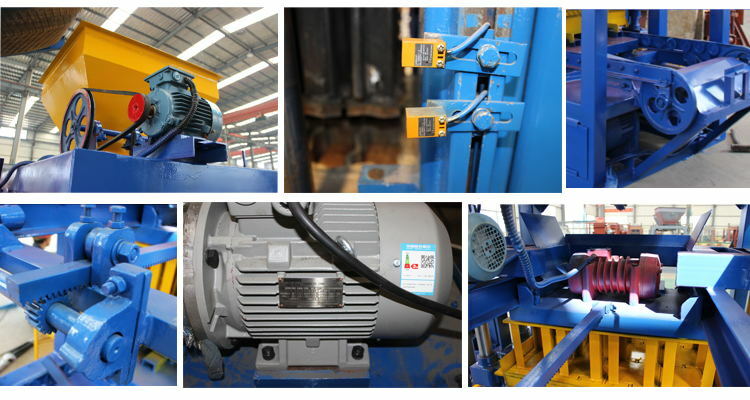 Based on those strengths, our interlocking brick machines for sale has longer service life and better performance. 1. 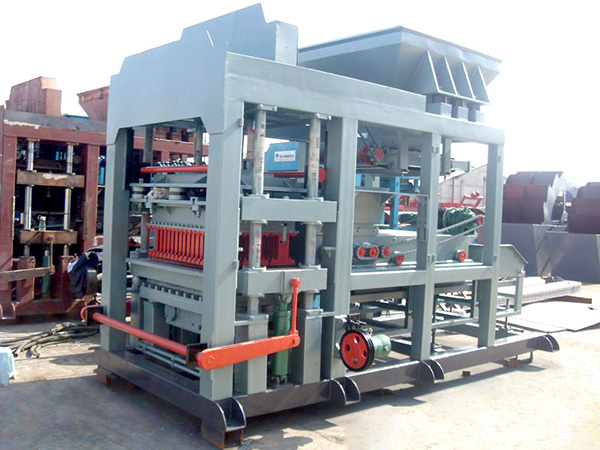 Frame work structure of interlocking brick making machine design. We have design interlocking brick making machine into frame work type of structure. It has compact structure that has advantages of steadiness, good ability extension. 2. Manufactured by High-quality manganese steel. 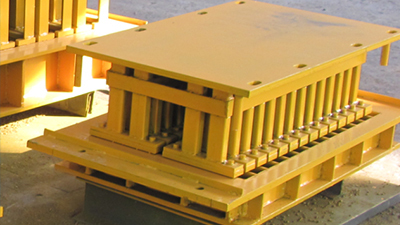 We adopt thick manganese steel to manufacture high-class quality interlocking block machine. 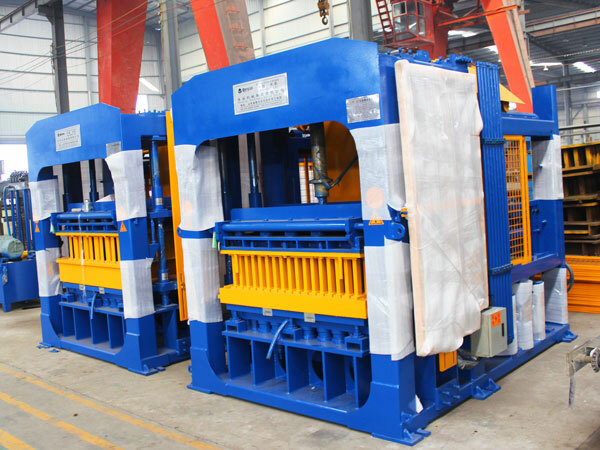 Honestly to say, there are 3 kinds of steels manufacturing brick machines, which are ordinary steel, carbon constructional steel and manganese steel. And the price of manganese steel brick interlocking brick machines are most expensive, while ordinary steel brick machines are the cheapest. So, in some degree, interlocking brick making machine price is fluctuating with the price of steels. 3. Hydraulic transmission. 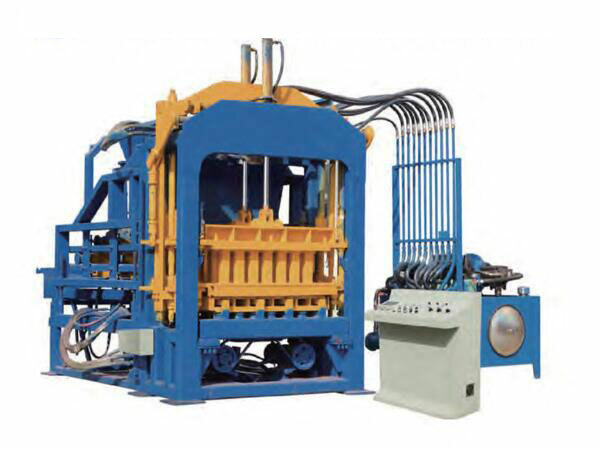 Hydraulic interlocking brick making machine from aimix group has been applied the technology of hydraulic transmission. The structure of hydraulic system is simple and light. 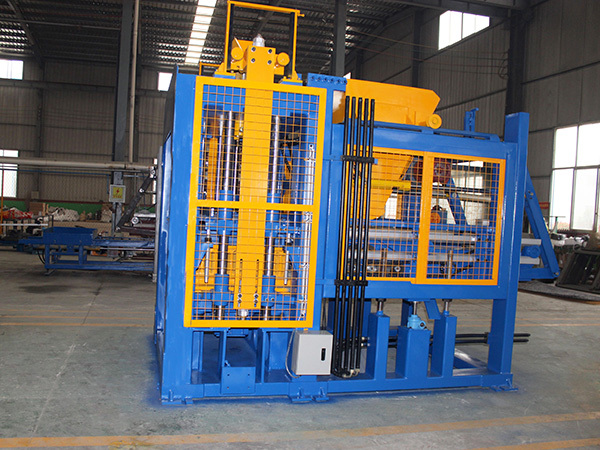 With the help of it, interlocking brick machines could act more steady performance, easy to operate and achieve complicated automatic working circulation. Since the simple interlocking bricks manufacturing process, customers can produce good quality interlocking bricks if they just complete one circle of manufacturing. 1. Drivers of wheel loaders add raw materials to the batching machine of interlocking blocks machine. 2. The computer operator sets program of the proportional recipe and prepare the raw ingredients. 3. The prepared raw ingredients automatically load into the hopper of the mixer. 5. 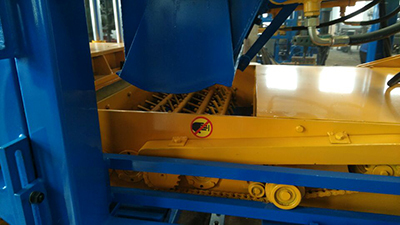 After mixing, the discharging hopper opens, then the material is transported to the main storage hopper of interlocking brick making machine for sale by belt conveyor. After that, another belt conveyor under the storage hopper will transport raw materials into feeding machine of interlocking brick machine. 6. After the resetting of the mould, the feeding machine moves forward and place materials into mould box. 7. Feeding machine returns back, at the same time pressure head move down accompanied with vibration. 9. 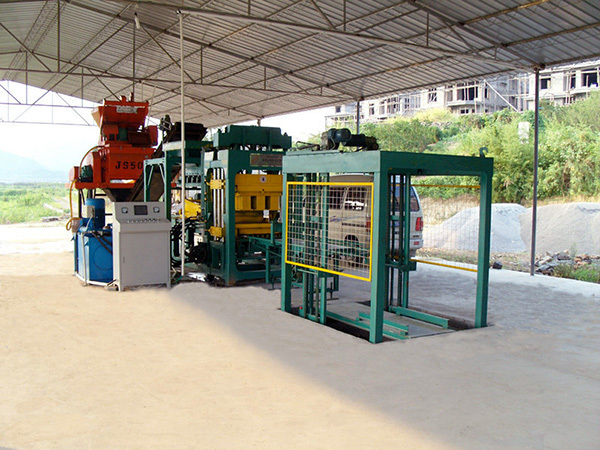 Board machine automatically transfer bricks to automatic stacking machine. 10. Use folk lift truck to transport bricks from interlocking brick machine manufacturing area to finished product area. After solidification, generally speaking, bricks should be watered in the second day, and then watered two or three times every other day. After maintenance, bricks can be used in 5-7 days. 1. Mixing station. 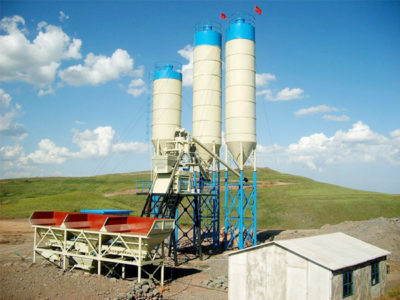 It consists of batching machine, mixer, cement silo, spiral, and meter machine. 2. Water weighing and controlling system of mixing station. It can be equipped according to customers’ For example, if customers is not strict at the proportion of raw materials, just equip a main mixer is okay. 3. The second feeding machine. It is mainly used for the production of colored bricks. 4. Wheel Loaders. 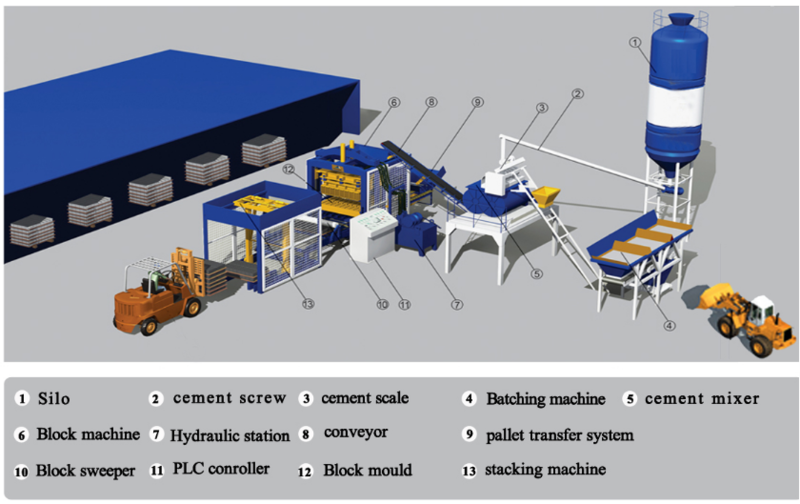 Feed materials to batching systems of interlocking stone making machine. In general, 2-3 tons of loader is enough to use. 5. Battery car for forklift truck or brick free machine. Move the stacked wet bricks to the finished product site, generally a 3 tons of forklift is enough. 6. The brick clamping machine. 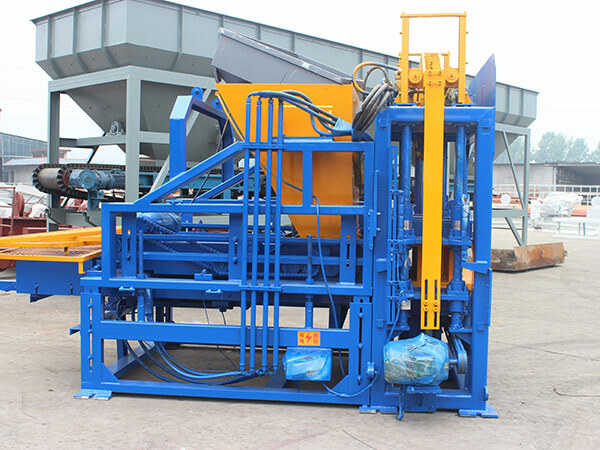 It is used to load or transfer the cured finished bricks. * Training how to install,operate and maintain the interlocking brick making machine. * One year guarantee for the whole machine. * Operation manual is available. Our factory was established in 1982, located in Xingyang, Zhengzhou, the capital of Henan Province, which is called the base of construction machinery in China. 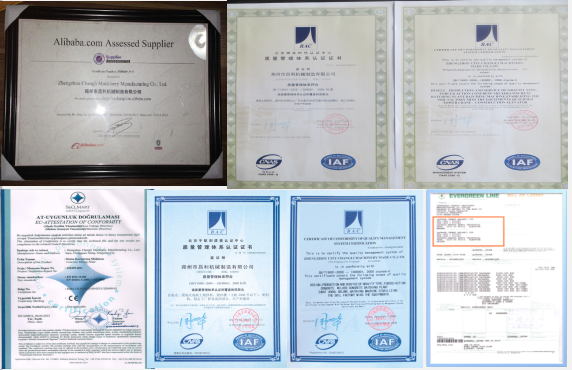 We are the Top 1 Construction Enterprise in Henan province, Till now, our interlocking brick making machine for sale has been exported to more than 30 countries and areas, such as Russia, Uzbekistan, Philippines, Malaysia, Vietnam, Thailand, Pakistan, Sir Lanka, Indonesia, Australia, America etc. 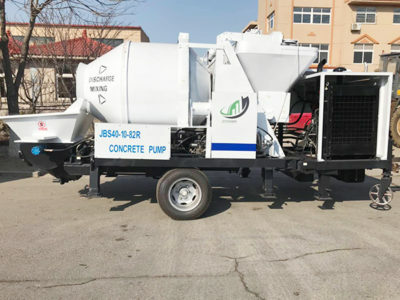 At the same time, we also supply concrete block making machine, solid brick machine, fly ash brick making machine, and automatic brick making machine If you have requirements of interlocking brick machine, and other equipment of brick machine, you can contact us on the website or send emails to us, we will reply you immediately.